It’s hot but kids still need to exercise. With the hot days of summer come summer sports — baseball, tennis, football practice — both in the neighborhood and at camp. Before you send the kids out to practice — or just for a long day of play in the sun — learn to protect your child against the dangers of dehydration and heat illness. WebMD turned to Albert C. Hergenroeder, professor of pediatrics at Baylor College of Medicine and chief of the sports medicine clinic at Texas Children’s Hospital, for answers to parents’ common questions. Early signs of dehydration include fatigue, thirst, dry lips and tongue, lack of energy, and feeling overheated. But if kids wait to drink until they feel thirsty, they’re already dehydrated. Thirst doesn’t really kick in until a child has lost 2% of his or her body weight as sweat. Make sure they drink cool water early and often. Send your child out to practice or play fully hydrated. Then, during play, make sure your child takes regular breaks to drink fluid, even if your child isn’t thirsty. A good size drink for a child, according to the American Academy of Pediatrics, is 5 ounces of cold tap water for a child weighing 88 pounds, and nine ounces for a teen weighing 132 pounds. One ounce is about two kid-size gulps. Know that dehydration is cumulative. If your child is 1% or 2% dehydrated on Monday and doesn’t drink enough fluids that night, then gets 1% or 2% dehydrated again on Tuesday, that means your child is 3% or 4% dehydrated at the end of the day. “They may be gradually developing a problem, but it won’t show up for several days,” says Hergenroeder. “You should always monitor your child’s hydration.” One way to do this: weigh your child before and after practice. If his weight drops, he’s not drinking enough during his workout. A simple rule of thumb: if your child’s urine is dark in color, rather than clear or light yellow, he or she may be becoming dehydrated. A growing number of athletic programs suggest that it is sometimes too hot to practice. 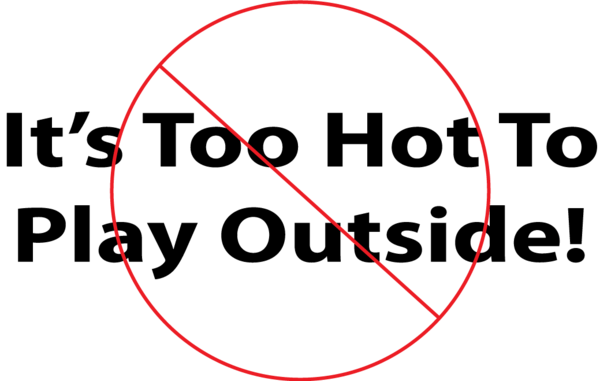 In fact, many are restricting outdoor practice when the National Weather Service’s heat index rises above a certain temperature. The heat index, measured in degrees Fahrenheit, is an accurate measure of how hot it really feels when the relative humidity is added to the actual temperature. You may consider martial arts in an air-conditioned center during the hot days of summer. Contact us for a free beginners class.